Accentuate Your Bedroom: This queen-sized bedding set comes with a duvet cover and two pillowcases. It features a floral pattern that has a paisley with blue, red, orange colors and cream accents. The detailed paisley design is sophisticated, giving off a luxurious feeling right inside your bedroom. Sleep Tight and Just Right: Since it’s made of 100% cotton with a 200-thread count, this bedding set is super soft for your comfort. The fabric is made of breathable cotton that will keep you comfortable in all temperatures. Don’t let anything interrupt a great sleep, additionally this duvet cover has a bottom snap closure to help you fit it in a queen-sized comforter with ease. Simple Care Instructions: This set is machine washable for hassle-free cleaning. The cotton fabric is incredibly durable and able to last through countless washings to give you a peaceful and clean sleep. Clean this set using hot water at 140°F (60°C); do not use bleach, and tumble try on a normal setting. 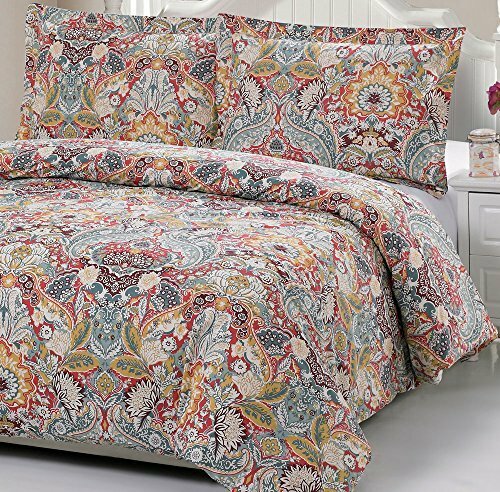 The Paisley Duvet Cover Will Help You To: Tidy up your bed, add flair and style to your bedroom, keep comforter clean, easily wash when needed. Enjoy great quality at an affordable price, and upgrade your bed accessories at the same time. 200 Thread Count: This queen/full size set is made of 100% breathable cotton for all night comfort, and deep sleep. Made with quality craftsmanship this duvet cover is built to withstand countless wash cycles. Fit for a Queen: The duvet cover is 86 inches on all sides, and each pillowcase measures 20 x 30 inches. Complete your bed ensemble with the 2 pillowcases, and give your bedroom a streamlined look. Floral Bed Décor: This set also features a paisley pattern with a mix of colors and cream highlights, a design that evokes feelings of restfulness and peace. Give your bedroom the sense of calm it requires for you to get a peaceful rest. Very Soft and Comfortable: The 200-thread count makes this bedding set super soft and comfy. It’s also machine washable for a hassle-free cleaning all the time. Take the covers out to throw it into the washer and dryer, it will fit in any size washer with ease. Fits the Bill Perfectly: Give your bedroom a Shabby Chic, or French Country décor and create a feeling of peace. Decorate your home with high-quality goods, and without having to pay premium prices.